Originally set to aid the attainment of women’s suffrage worldwide, International Women Day has since 1910 become a symbolic day for women’s struggle. On this day, FIAN International, together with the World Forum of Fisher Peoples (WFFP), the World Forum of Fish Harvesters & Fish Workers (WFF), The Transnational Institute (TNI) and CROCEVIA would like to call the world’s attention to fisher women’s struggle for their right to food and nutrition. 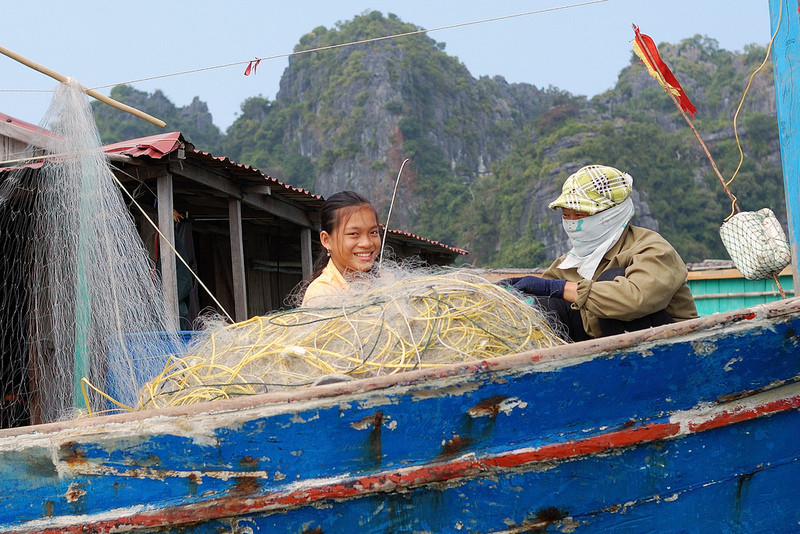 Women play a crucial role in the fisheries throughout the entire food production line – from fish catching, marketing, auctioning, and activities such as processing, packaging, producing added-value products and providing services to boats on landing sites. During pre-harvest, women are responsible for skilled and time-consuming tasks, such as net weaving or meal preparation. Throughout post-harvest activities, they engage in fish trading, fish smoking or processing. Other activities also include female artisanal hand collecting, for example, collecting shellfish in backwaters and lagoons. These activities may be paid or unpaid, and vary across regions. However, one thing stands out: this multidimensional role played by women remains uncompensated and/or unrecognized. First, fishing is still perceived as a predominantly male task despite the heavy workload of women. Care and household activities are not recognized as “real work”. And female jobs such as head loading and selling of dry fish are undervalued. Also, as the United Nations Special Rapporteur (SR) on the Right to Food has also highlighted, women often perform the lowest-paying jobs, are likely to receive lower wages than their male counterparts for the same work, and are usually underpaid by intermediaries along the supply chain even when they work as independent full-time fishers. Furthermore, with declining fish stocks, migration of men in search of alternatives has ultimately increased the burden on the women left behind. A reality that has ultimately transcended social cultural norms by increasing women’s presence in fish catching activities, yet continuing to conserve their gendered assigned roles which requires them to remain the main bearers of social reproductive work. Thirdly, unregulated access to oceans provided by states to corporate actors has led to an increase of displacement and externalization of labour from the fisheries working sector and has resulted in the feminization of labor. As noted by the SR on the Right to Food, even with formal employment in the sector, women work under poor conditions in the absence of childcare accommodations, maternity leaves or protection against occupational hazards. Additionally, women continue to face different forms of harassment at the workplace, while private actors benefit from weak law enforcement. Overall, it has been indicated by the SR on Human Rights Defenders Michael Forst on his annual report on women’s rights defenders this year, that “globalization and neoliberal policies” such as the ones listed above, have “led to economic disempowerment and power inequalities that affect the rights of women.” Through their implementation, projects which destroy the environment and displace communities generate marginalization, impoverishment and fragment communities and families. However, women defenders, as Forst emphasizes, have been at the forefront protesting such changes and claiming their rights, often with far fewer resources than those whose actions they resist. Despite often living under discriminatory social norms and authoritarian governments that criminalize those who challenge the State-corporate nexus, women continue to organize to defend their rights. The right to adequate food and nutrition demands an integrated approach that ensures that all structural causes of hunger and malnutrition are addressed all along the food chain – from access, control, management and ownership of water bodies, to food processing, marketing and promotion, protection in the workplace, and to decent income and consumption patterns, up until the very moment in which food is effectively consumed as a needed element for nutrition and health, individually or in community with others across their respective life spans. WFFP, WFF, TNI, CROCEVIA and FIAN International therefore invite other human rights organizations to join forces and demand States, to implement their international legal obligations set out in the human rights treaties and soft legal instruments that protect women by ensuring their entitlements to resources and a pursue a world free from multiple forms of violence, such as the Small Scale Fisheries Guidelines, General Recommendation 34. of the CEDAW Committee on rural women’s rights, and norms in the recently approved Declaration on the Rights of Peasants and Other People working in rural areas.